Comment: There’s no surprise on what is happening with EA’s earnings, they have everything laid out for the next 3-4 years. The problem is that the stock price is already full valuing everything. Comment: Demco has been one of the star performers of the past few years with the expansion into renewable energy, this PP and warrant is most likely going to be well received by investors and the market. Want to feel like a rock star investor? 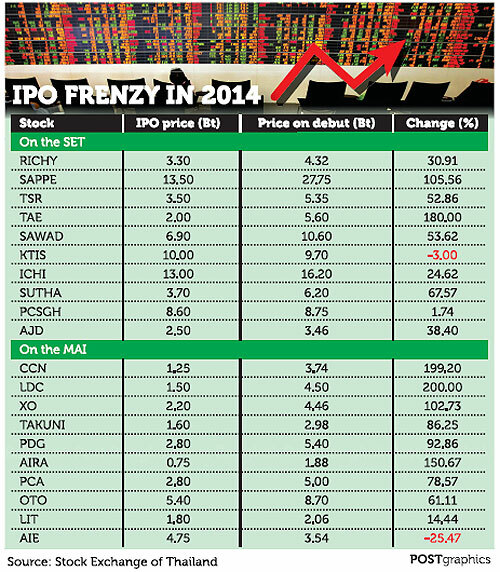 Get into the small IPO’s. Anyone who was able to get IPO’s this year has been feeling that way, excluding IPO’s where commercial bank’s were the underwriters (here’s looking at you KBANK and SCB). The basic framework for IPO’s performing well on their first day hasn’t changed, if the market cap, free float are small enough, first day returns were and are likely to continue to be amazing given the market environment. Comment: If you think about it, a 15% decrease in bookings despite all the negative news about Thailand, and yet domestic flights are still operating at a 90% load factor, thats not too bad at all! Comment: Since the BTMU has become the majority shareholder in BAY, its stock price has re-rated to valuations levels similar to SCB and KBANK, is this warranted? Perhaps. Comment: CGD is going to become popular in the news, announcements of their new massive project, booking revenues from their massive project in Srinakarin and now a REIT (but with what?) towards the end the year. Comment: AAV – still the best airline play in Thailand within the airline space and a recovery idea to boot. Comment: We’ve been waiting to see how CGD would pay for this massive project, well there you go, raise some THB 500 mn via a PP. Comment: Still trading at valuation discount to STPI despite it being involved in the same industry. Comment: So this another company that will benefit from the digital tv, still not quite confident on its foray’s into this “game” market. Comment: This interior decorator has some lumpy earnings, there is no surprise that net profit may grow over 100%, especially given that it dropped some 95% in 2013.